"Toshiba and SanDisk's Flash Forward partnership is ready to populate the newly constructed Fab 5 in Yokkaichi, Japan. Both companies announced new 3bit-per cell (X3) Bit Cost Scaling (BiCS) Flash with 48-layers on an unknown lithography process node. 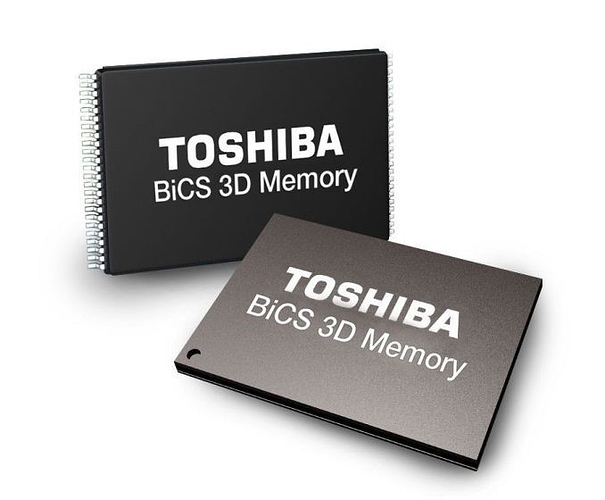 The new 3bit-per-cell BiCS just announced increases the number of layers to forty-eight, and the die density to 256 Gbit. That's 32 GB in the size of your pinky fingernail. Companies can already stack up to sixteen die in a package. Our calculator tells us that's 512 GB of TLC NAND flash per package. Companies often use up to 16 packages in high-performance client SSDs. If everything works as intended, we could very well see 8 TB client SSDs within the next two years.